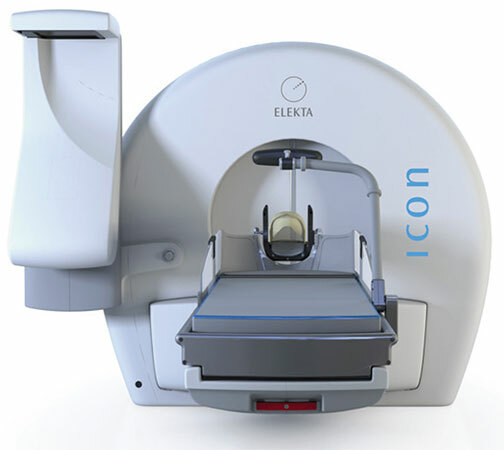 The Leksell Gamma Knife® Icon™ uses a motion-tracking mask, an alternative to the head frame, that allows for new treatment options that were not possible in the past. Treatment of malignant brain tumors can now be performed via precision radiosurgery using a flexible, removable mask placed over the face. This type of motion tracking technology has long been used to treat other types of cancers, such as lung and liver. This fall, Penn State Cancer Institute was one of the first in the country to utilize a new upgrade for Leksell Gamma Knife® Icon™ radiosurgery, using a motion-tracking mask in addition to the conventional headframe option. The radiation sources and beam technology are unchanged. According to James McInerney, MD, professor of neurosurgery, “By adding an alternative to the head frame, it allows for new treatment options that were not possible in the past.” This translates into hope for patients who had certain types of brain tumors that might have had fewer options before, due to challenges with precise access to certain tumors. As before, a diverse team collaborates on each procedure to provide the best possible outcome for each patient. Led by a neurosurgeon and a radiation oncologist, the clinical team also includes a nurse, a medical physicist and a radiation therapist. With the upgraded technology, the team was expanded to include a radiation therapist, an individual who is specially licensed to deliver therapeutic radiation. Chief of Medical Physics, Michele Sutton Ferenci, PhD, DABR, oversees a team of physicists and radiation therapists. She leads quality assurance throughout each procedure, from ensuring the correct equipment operation to confirming the team delivers each patient’s most appropriate radiation dosage. Radiation therapists, members of the Penn State Cancer Institute team, who have several years of experience with Linear Accelerators (LINAC), a similar technology, can use that knowledge with the Icon system. In addition, they are highly trained to make masks and observe patients for the kind of minute motion that occurs in the absence of a stereotactic headframe while treatment is being administered. Treatments are delivered by the radiation therapist under the direct supervision of a radiation oncologist and medical physicist. The upgraded Gamma Knife technology, combined with the long-established team approach at Penn State Cancer Institute, bring together advanced science and years of experience to benefit the care recipient—the patient. “Each professional brings a different piece to the puzzle, and we are all together during each procedure, so we can collaborate and make any necessary adjustments to ensure that we’re implementing the best treatment plan we can,” says Ferenci. INTERNSHIP: Surgery, general, National Naval Medical Center, Bethesda, Md. FELLOWSHIP: Medical physics, Emory University, School of Medicine, Atlanta, Ga.
GRADUATE SCHOOL: Nuclear and radiological engineering, Georgia Institute of Technology, The George W. Woodruff School of Mechanical Engineering, Atlanta, Ga.